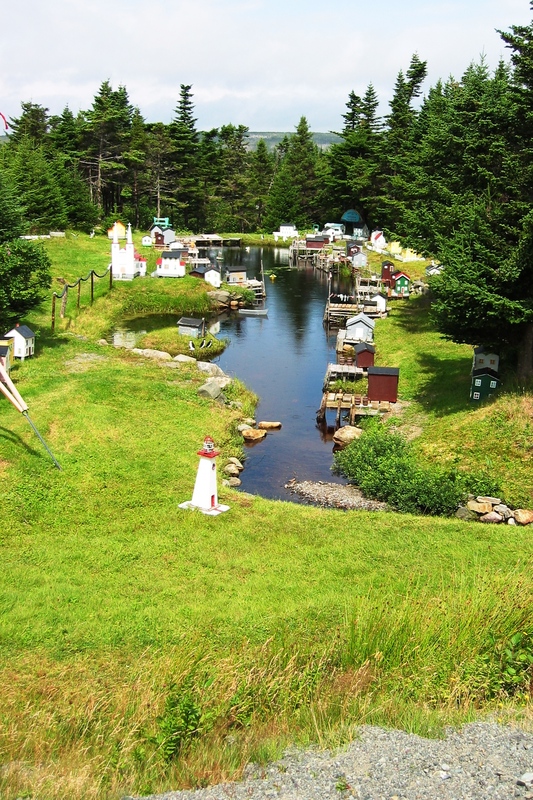 We drove through the “Irish Loop” south of St. John’s and around to the southern coastline of Newfoundland. Folks within the “Irish Loop” have a brogue so thick that we could hardly understand them at all. The land there was rolling hills and there were a few gardens and farms. 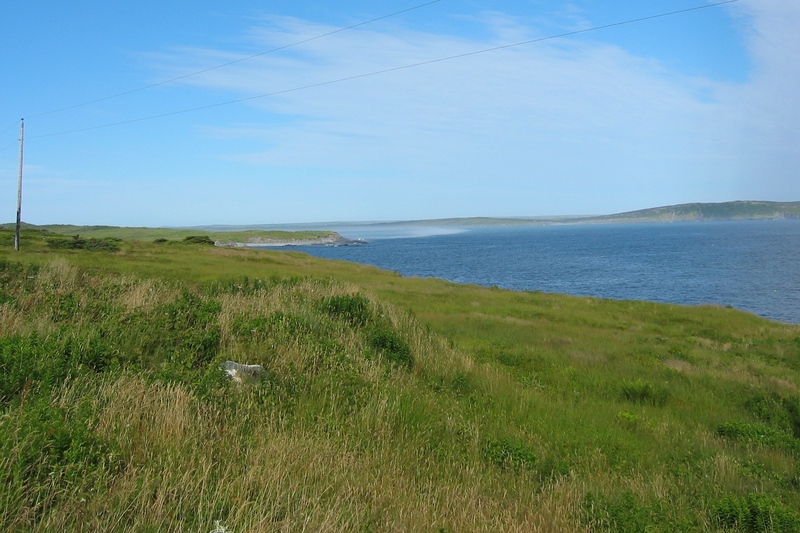 On the southern coast we found plateaus with bogs – here is where there are several wildlife reserves, more whales can be seen, and where caribou are more often spotted. We stayed overnight at the end of a gravel road that was about 5 miles long (to the lighthouse). We checked with the retired lighthouse keeper (who lives at the house there, since they no longer require a fulltime lighthouse keeper). He pointed us to where we could pick some “bakeapples” (a Newfie berry we had already tasted – pretty tart). We saw several whales off the coast. 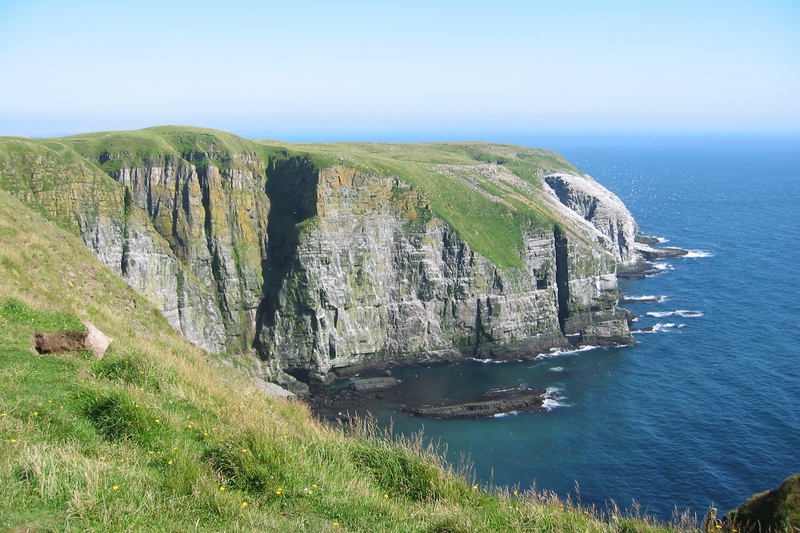 The next day we drove to a peninsula (St. Shotts) where there had been a lot of shipwrecks. It was so foggy and spooky we turned around and didn’t go to the end. 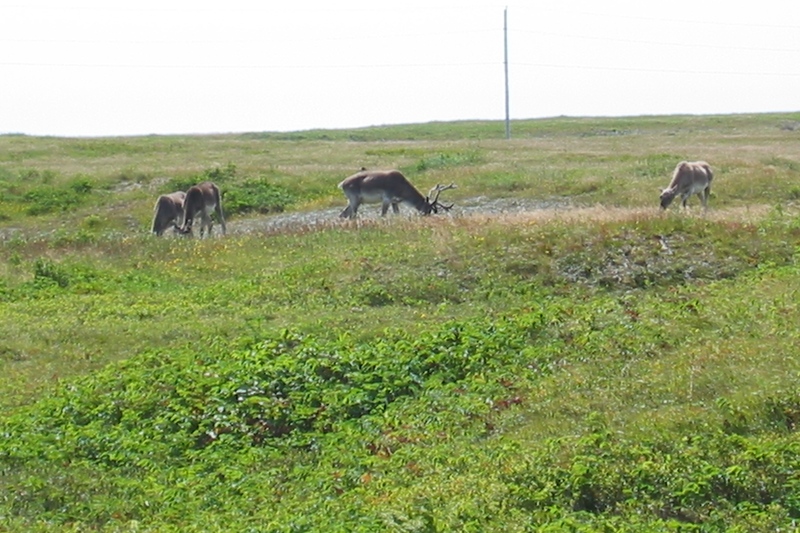 As we returned, we saw a small herd of caribou. We ventured on to St. Mary’s Ecological Reserve. 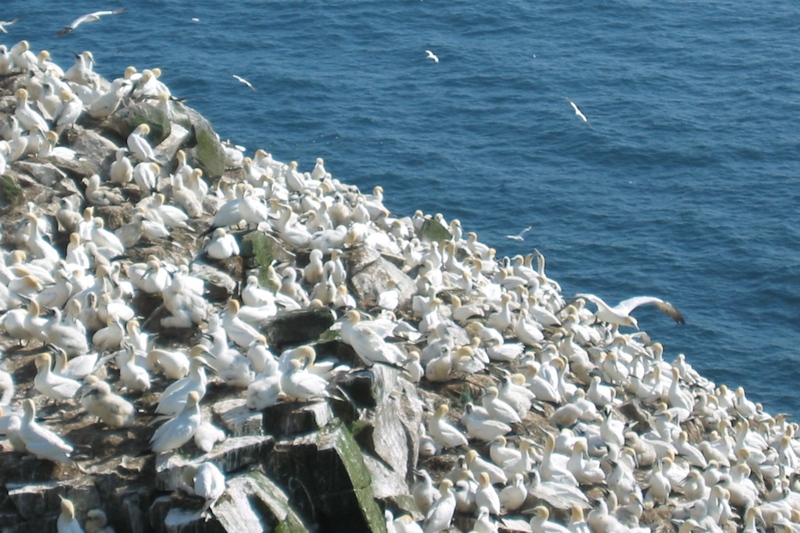 It is at the end of another peninsula, and has a large colony of several birds, including gannets (6-foot wingspans). The primary attraction there is Bird Rock, which when seen from a distance looks like someone took a can of paint and poured it on top of a rock (with buzzing insects around it). As you get closer, you realize just how many birds there are. Yes, it was interesting – but the smell. I couldn’t wait to leave. Thankfully we couldn’t stay at St. Mary’s as we had intended (no overnight parking) so we had to continue on. It had already been a long day, and from here we started to experience very hilly roads with lots of damage from the Tropical Storm that forced that first ferry ride to detour. Chris uttered a few words that cannot be repeated as she deftly avoided potholes, pulled over to let faster traffic pass, and encouraged the RV to pull up gravel inclines (at times). We ended up happily pulling into yet another gravel shoreline area, with another RV from Florida. 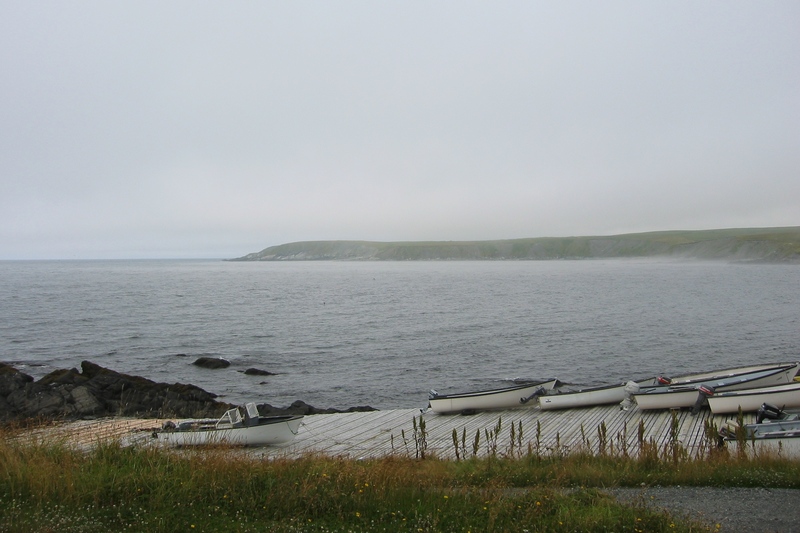 The following day we drove about an hour to the area where the ferry leaves for Nova Scotia. Along the way we were treated to a unique yard decoration. We were scheduled to check in for the 15 hour ferry ride at 11:30pm, and the ferry was to leave at 12:30am. We had very little additional driving to do, so we did all the laundry and checked in early for the ferry – around 3:00pm. They were opening at 5:00pm to start checkin, so we just parked and chilled in the parking lot. About 4:00pm I received a call on my cell phone announcing that the ferry’s departure was delayed – until 7:00am the following morning with a 4:00am start of checkin. Since we were tired, had done all we had planned to do (and were a bit of a drive from any new adventures) we decided just to overnight in the parking lot there (which was OK with the ferry company only because of the delay). We purchased our tickets at 5pm, got our tires sprayed with insecticide, and parked in our assigned line. We set the alarm for 4:00am (thinking that would give us about an hour before boarding might start), and sure enough there were announcements over the loud speakers starting around 4:00am, but we didn’t board until around 6:15, and then sailed at 7:00. Five movies, three cups of coffee, and two ice cream cones later we arrived in Nova Scotia around 8:30pm, zoomed to the nearest KOA campground where we had stayed before, and slept like logs.